Good morning. I'm delighted to join you today for the opening ceremony of the "Hong Kong Belt-Road City-to-City Cultural Exchange Conference." For a few years now, much has been talked about the Belt and Road Initiative and many conferences have been held in Hong Kong harping on this important theme. But placing "culture" as the theme of a Belt and Road conference is quite pioneering and commendable. It is definitely something to be welcome by my Government for a few reasons. First, as I have mentioned in my speech at the Asia Cultural Co-operation Forum 2017 Gala Dinner held last week, culture has been given increasing prominence by government leaders, including our Chinese leaders. I quoted from General Secretary Xi Jinping's 19th Congress Report delivered on October 18 this year that culture is a country and a nation's soul and the country of China will thrive only if the Chinese culture thrives, and our Nation will be strong only if our culture is strong. It is therefore acknowledged in his report that we must provide our people with rich intellectual nourishment to meet the people's new aspirations. Secondly, the Belt and Road Initiative is not only about trade and business. One of the five main areas of connectivity which this Initiative sets to boost is people-to-people bond. In this area, as mentioned by the Chairman of the National People's Congress Standing Committee Mr Zhang Dejiang at the inaugural Belt and Road Summit held in Hong Kong in May last year, Hong Kong has been an important window for cultural exchanges between the East and the West given our open and inclusive cultural atmosphere. Thirdly, culture occupies an important place in my vision for Hong Kong as portrayed in my maiden Policy Address delivered on October 11 this year. 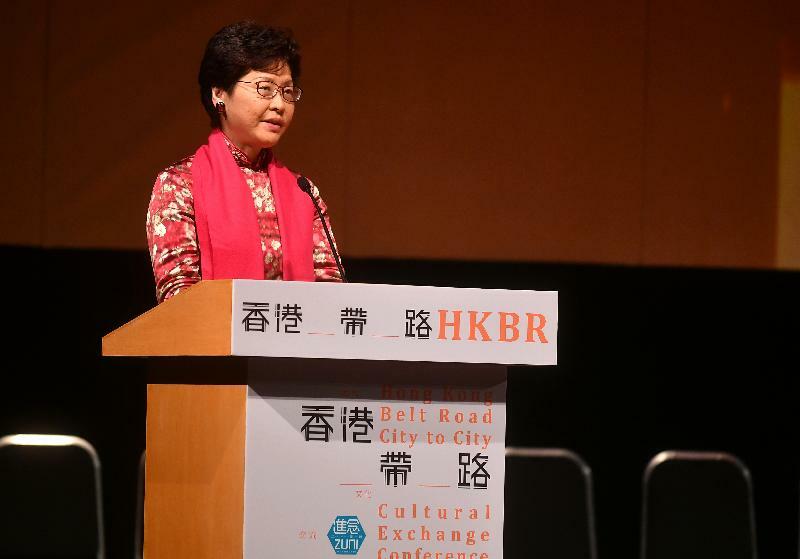 My Government will continue to provide the policy and resources for transforming Hong Kong into Asia’s cultural hub and taking advantages of our cultural foundation to promote people-to-people interactions along the Belt and Road. Indeed, as the senior civil servant responsible for cultural policy a decade ago for four and half years, I can promise you that culture will be very close to my heart as the Chief Executive of the Hong Kong Special Administrative Region (HKSAR). I must therefore express my most sincere gratitude to Zuni and her Artistic Directors, Danny Yung and Mathias Woo for bringing to us this international cultural gathering. Indeed, this is not the first time that Zuni brought us such important global or regional connections. Zuni initiated a Greater China cultural conference in 1998, a year after the establishment of the Hong Kong Special Administrative Region. That conference's focus, then as now, is on the artists and cultural professionals of four Greater China cities: Shanghai, Shenzhen, Taipei and Hong Kong. That is the reason why it is commonly referred to as the 4-City Conference. As Danny has said of Hong Kong’s return to our motherland China, it "would be a cultural opportunity to initiate an important discourse on Chinese culture, Chinese and foreign cultures, as well as Eastern and Western cultures." The City-to-City Conference has brought that "opportunity" to creative life. And we are all the better for it. Each year, critical developments in arts and culture are discussed, together with broader issues such as creativity, arts education and cultural challenges. The mission is laudable: to champion and promote the sustainable development of arts and culture in the participating Chinese cities. And, no less important from my Government's perspective, to showcase the role of Hong Kong as a regional cultural capital. This year, given the widespread interest in the Belt and Road initiative, Zuni has expanded its ambitions by running back-to-back cultural events, beginning with the 4-City Conference, which ended yesterday, and continuing these two days with the first "Hong Kong Belt-Road City-to-City Cultural Exchange Conference." That decision has been well received, with more than 70 arts and cultural practitioners, cultural policymakers and scholars from all over the world here in Hong Kong to share their vision and their experience under the theme of "Cultural Exchange and City Branding". This welcome occasion presents an excellent opportunity for cities along the Belt and Road to build connections, and for their cultural leaders to create opportunities. It offers as well the promise of greater co-operation between the cultures and creative industries of East and West. This is indeed that an essential aspect of the Belt and Road Initiative: the building of connectivity, not only in infrastructure and commerce, but in culture and the arts, thereby creating ties and enriching people-to-people bonds. Mathias has just mentioned his aspiration for this city conference to become a sustainable platform. I want to assure you, Danny and Mathias, that the HKSAR Government will certainly give you that support in many years to come. On that note, I wish you all a rewarding conference and a New Year overflowing with creative and cultural promises. Thank you very much.